Sheer space is the main draw at Villa Manis, where eight bedrooms are housed in four separate pavilions spread out among lush gardens surrounded by rice paddies. 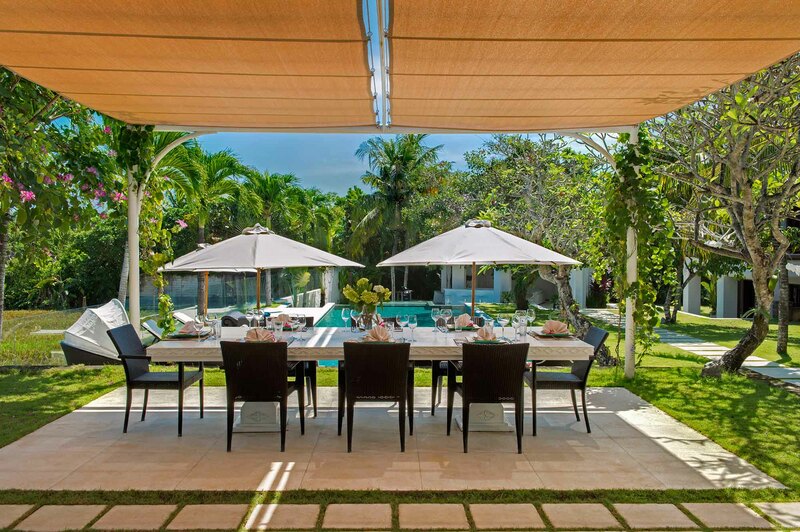 The villa boasts plenty of indoor and outdoor lounging and dining areas, a 17-metre pool, its own spa and gym, and gorgeous rooms decorated in original artworks and antiques. 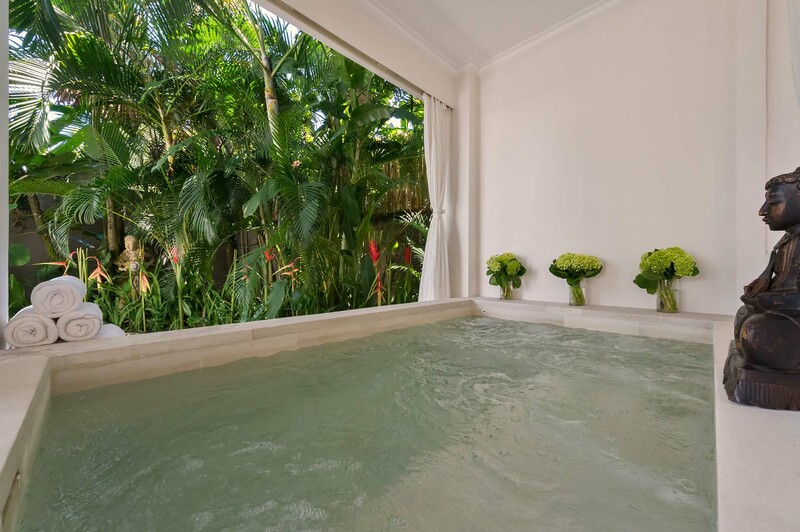 Located in Pererenan just minutes from the beach and the laid back locales of Canggu, this is the perfect escape for a wedding, special event, or families travelling together. 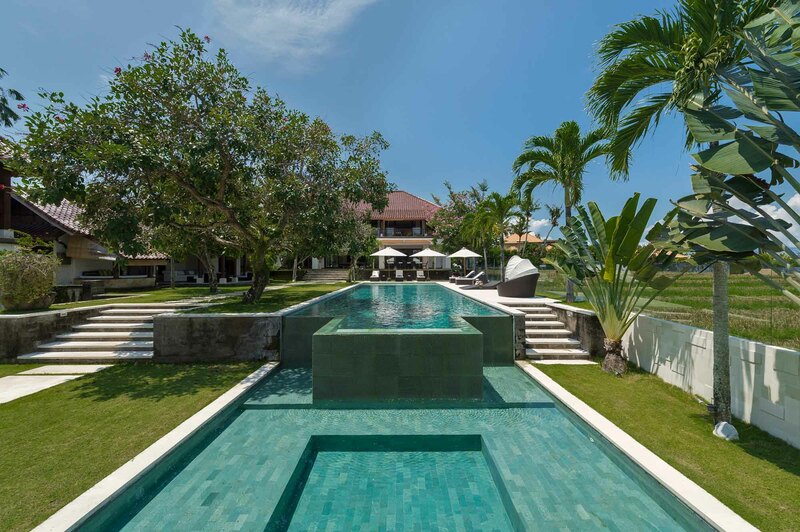 Everything is grand at Villa Manis from the sprawling gardens to the soaring ceilings in the villa pavilions, the lengthy sofas, and apartment-sized master suite. Yet despite the size, socialising is easy here with a sleek poolside lounge with leather sofas and al fresco dining areas and sunny pool decks with sun loungers. Of course if you want some solitude, you can escape to the serene spa, hit up the gym or recline on your private balcony or terrace in your suite. And with the beach just minutes away and Canggu and Seminyak close by, adventures and excursions are definitely in the cards. 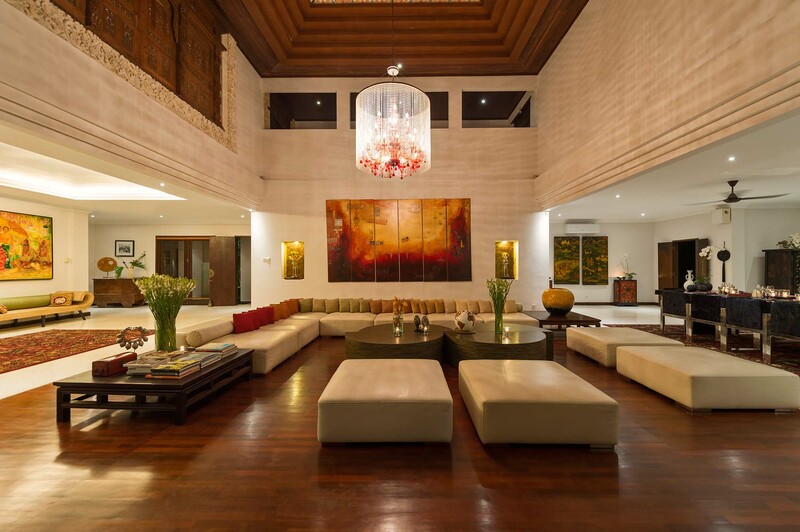 The entrance to Villa Manis is in the main villa pavilion, and it opens up into a huge indoor living room with a stunning ceiling painted with scenes from Balinese mythology, soft sofas and chairs, wooden coffee tables and eye-catching artworks. The ground floor also houses an indoor dining area with a wooden table for 12, the kitchen, and an air-conditioned media room with comfy couches, a 60-inch TV, and PlayStation. 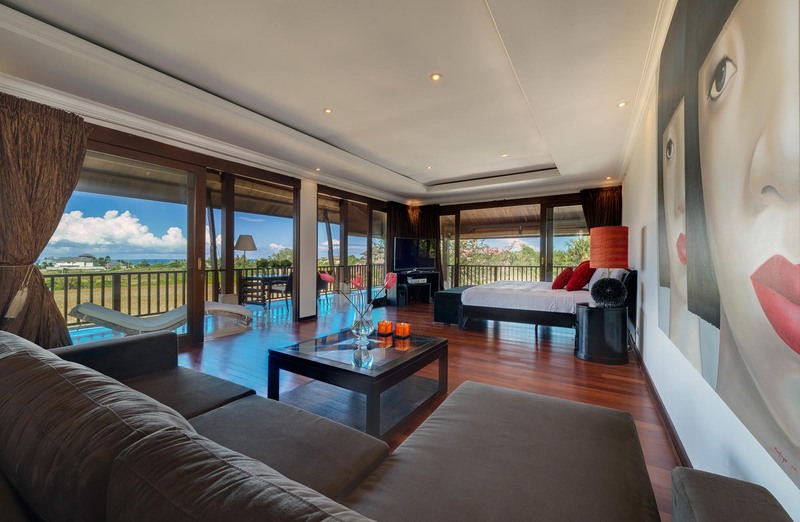 The entire top floor is dedicated to the palatial master suite with its wrap-around balcony overlooking the sea and stunning bathroom with a Jacuzzi bath and leather sofas. Set back from the living room there is a guest bedroom decked out in cinnamon wood and terrazzo floors and boasting a private courtyard and ensuite bathroom with an outdoor shower. The second pavilion houses the spa, where you can indulge in traditional Balinese massages or just chill out with a cup of tea in the breezy open-sided lounge area. On either side of the spa there are guest bedrooms with twin beds that can convert to a king, outdoor sitting areas with access to the pool and gardens, and beautiful ensuite bathrooms with outdoor showers. Head over to pavilion three and you have your choice of two spacious bedrooms, one on each floor. The ground floor bedroom has dark hardwood floors, velvet couches and chairs, and an ensuite bathroom with an outdoor shower. The upstairs bedroom offers great views of the garden and ocean from the wooden balcony. Both rooms have king beds and fold-out couches for children or extra guests. 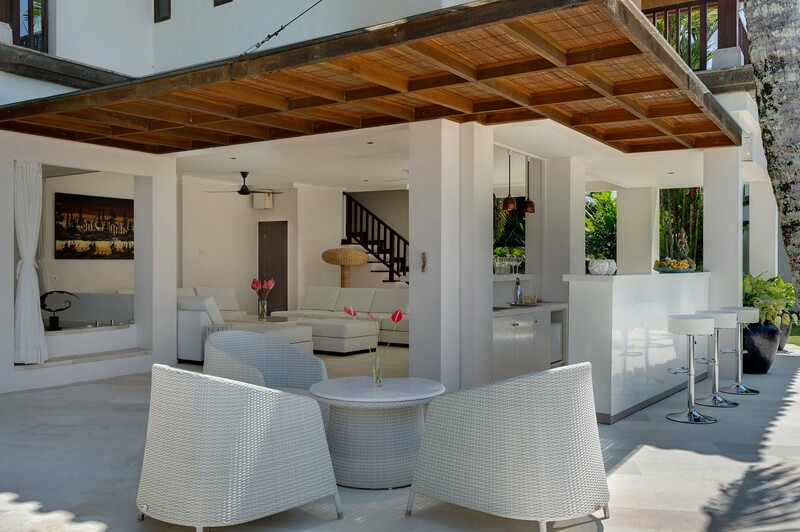 The fourth pavilion is where you will find the slick poolside lounge with a service bar. Upstairs there are two smaller guest bedrooms with twin beds, views of the rice paddies or gardens and ensuite bathrooms. These rooms are great for teenagers, friends or families with little ones. Outdoor living is a given at Villa Manis, as you can take dips in the ocean-facing pool, let the kids splash around in their own pool, dine al fresco amid sea breezes and under the stars, or relax with cocktails and good tunes in one of the two open-air living areas or pool house. There is also a gym to the rear of the property for those who want to keep fit while on holiday. LOCATION Pererenan village, Canggu, Bali, Indonesia. CAPACITY 16 people (eight double bedrooms: 4 with king beds and 4 with twins convertible to kings). 4 extra childrens’ beds available (extra cost applies). LIVING AREAS Air-conditioned living and dining room; media room; open-sided pool lounge with bar and open-air lounge. Alfresco dining for 12. POOL 17 x 5.5m main pool. 5.9 x 5.5m childrens’ pool. STAFF Villa manager; villa supervisor; private chef; housekeeping; security; gardener; maintenance; driver. Additional staff (babysitters, masseuses) available on request. COMMUNICATION WiFi internet access; landline for local calls; mobile phone coverage. ENTERTAINMENT Satellite TVs and iPod docks in all bedrooms; DVD player; surround sound; CD player; Media room with 60-inch TV. FOR FAMILIES Villa Manis is well equipped for families. Facilities include: a children’s pool; cutlery and plates; baby cot; high chair; DVDs; toys and pool toys. SPA In-villa treatments selected from a comprehensive spa menu can be carried out by professional beauty therapists in the villa’s spa room (extra cost applies). GYM & SAUNA The villa also offers a well-equipped gym with sauna. TRANSPORT Complimentary 7-seater car up to 8 hours a day, excluding petrol. 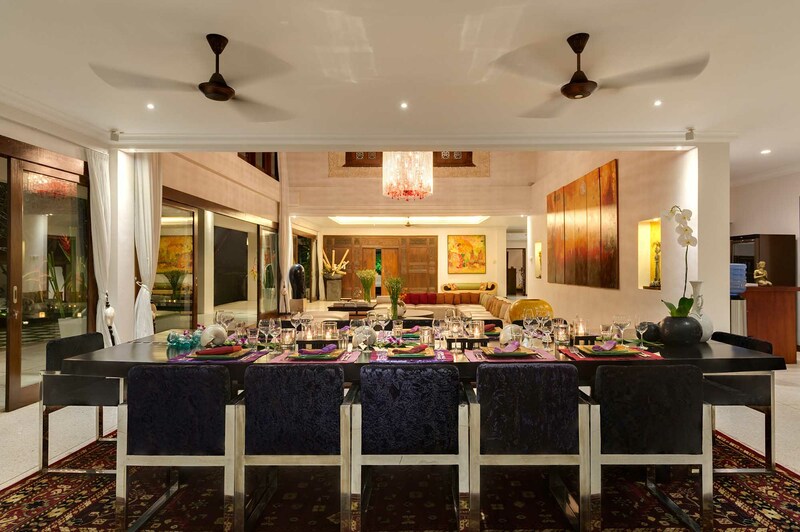 WEDDINGS & EVENTS Villa Manis is an exceptional weddings and events venue and can cater for up to 150 guests. ADDITIONAL Barbecue; diesel powered back-up generator; safety deposit. PROPERTY AREA 1,450sqm (villa). 3,500sqm (land). 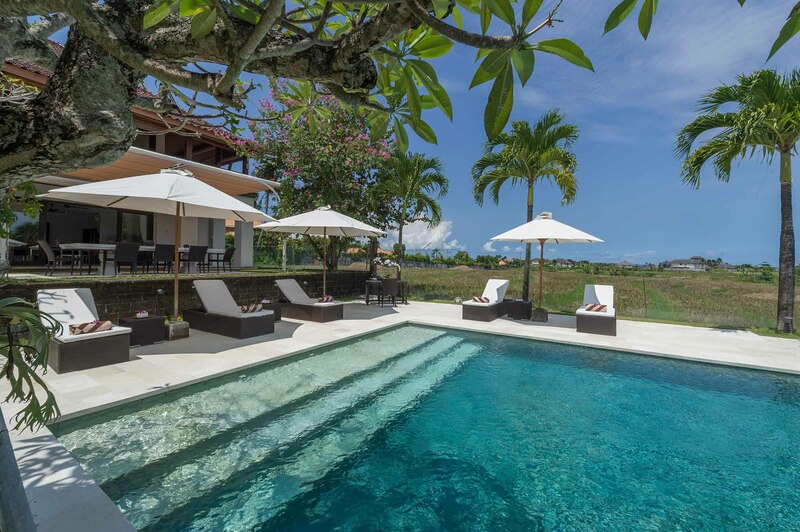 Villa Manis is located in the village of Pererenan in the north Canggu area. In the immediate vicinity are a few neighbouring villas, rice fields, coconut palms, temples and the general buzz of Balinese village life. The rugged Pererenan surf beach is less than a kilometre from the villa; here you will find a couple of cafés that serve simple food and offer great sunset views. 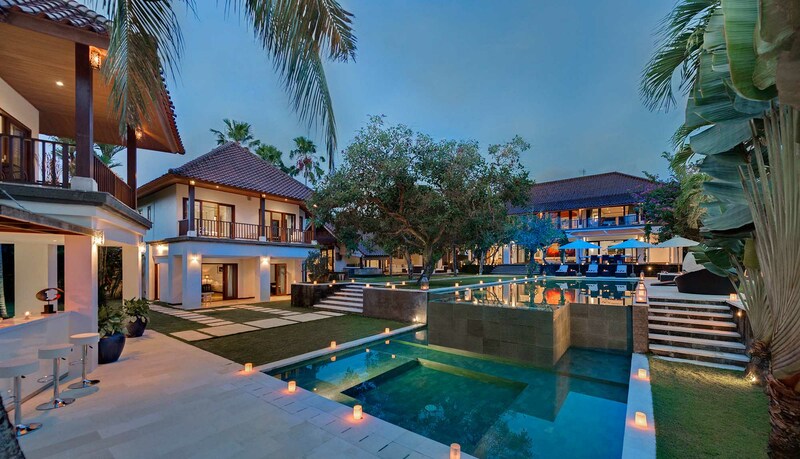 Less than half an hour away - and easily accessible thanks to the villa's complimentary car and driver - are the many restaurants, bars, boutiques, clubs and cafés of chic Seminyak.